For the GeoMaps, PaidListings and WidgetFactory add-ons you must be using the latest version of JReviews in order to be able to install the add-ons. The reason for this is that we are constantly improvement them and fixing reported bugs and are not able to provide support for old versions. 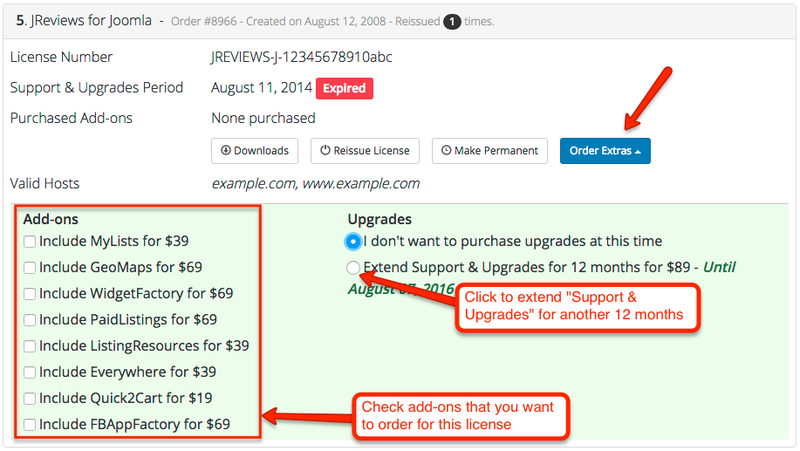 The option to extend your Upgrades & Support Package will only be available for orders that have expired upgrades. If you still have a few days left before your upgrades expiration you will need to wait until the upgrades expire before you can renew them. Log in to the Client Area on our website.